Due to its rich protein, carbohydrate, antioxidant, and fiber content, oats are a reliable source of nutrition for health-conscious people and one of the main food choices for several people. 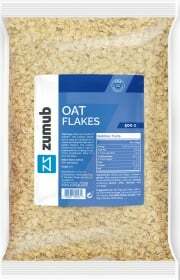 If you are looking to continue or to start adding oats to your diet and to enjoy a myriad of benefits, try Zumub Oat Flakes! Oats are loaded with complex carbohydrates that increase your energy gradually, making them an ideal breakfast for kickstarting your busy day. Oats are an excellent source of protein, which you need to build or maintain muscle mass and to ensure a good body composition, plus dietary fiber that helps you to feel full for longer, enhances digestive function and promotes the regular elimination of body waste. You also get loads of vitamins, minerals, and antioxidants that will help to fight oxidative stress and cell damage and to keep the proper function of your body. Zumub Oat Flakes supports your healthy and physically active lifestyle as it boosts your energy levels and provides you with an abundance of rich nutrients. These oat flakes taste wonderful when mixed with milk or other beverage, or added onto your smoothies, cereals, or recipes for your baked goods. Start your day with high levels of energy and experience a variety of benefits at the same time with a bowl of Zumub Oat Flakes! Have a question about Oat Flakes? What is it, what does it do, how and when to use or something else? Ask us. ALLERGEN INFORMATION: Contains Gluten,May contain allergens handled in the production facility: cereals containing gluten, soybeans, milk, lactose and nuts. Mix 50g with water, milk or your favorite beverage. Eat raw or cook for 4-5 minutes. For better fitness results: Add 30g of Zumub 100% Whey. WARNINGS Oat Flakes : Keep out of reach of children. This product should not be used as a substitute for a varied and balanced diet & healthy lifestyle. This product should not be used in case of hypersensitivity or allergy to any of its constituents. Store in a cool, dry place. BEST BEFORE: Please see lot number and expiration date stamped on the packaging.